The new Standard Chartered Mobile App is now simpler, faster and more secure for you. Enjoy new features such as viewing your balances and transactions with just one tap or have your banking alerts sent directly to your app. Send and receive money securely and almost instantly using a mobile number or NRIC. Use your mobile banking app to get cash at selected neighbourhood shops or mini marts. No purchase is needed. Transfer funds online to selected countries and enjoy best FX rate guarantee* at zero remittance fees. T&Cs apply. Track the status of your request for card replacements or fee waivers on the go. You can now update your profile and contact details with us almost instantly. a. 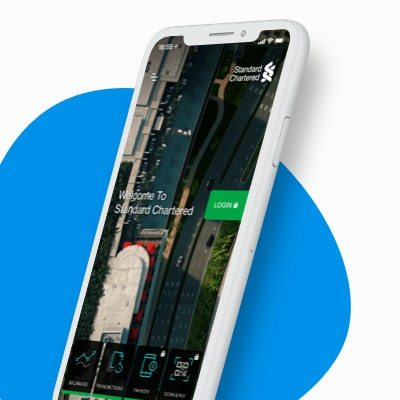 Standard Chartered Mobile Key – The physical security token card has been integrated into the Standard Chartered Mobile App, creating a seamless way to bank online via mobile. No more physical token cards or OTPs via SMS are required. 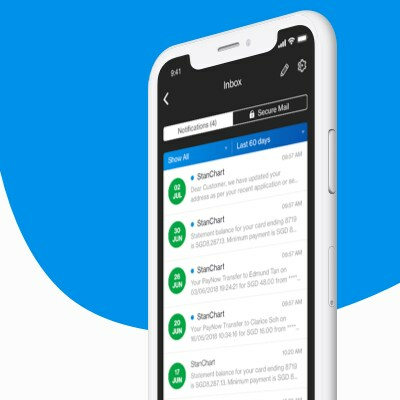 b. Inbox Notifications Feature – Have your banking alerts sent directly to your app and securely stored in an easy-to-manage inbox. c. Welcome Screen Balances and Transactions Feature – Register to view your balances and transactions on the go with just one tap. No login is required. Is it compulsory to register for these new features even if I do not wish to use them? You do not have to register for the Standard Chartered Mobile Key, the Inbox Notifications or the Welcome Screen Balances and Transactions features if you do not wish to use them. c. updating personal details such as mailing address, contact number and email address. What happens if I do not register for these new features? Standard Chartered Mobile Key: You will need to register for Standard Chartered Mobile Key to perform sensitive activities that require transaction signing from 1 October 2018. Inbox Notifications Feature: If you do not register for the Inbox Notifications Feature, you will continue to receive your banking advices over SMS and/or email. 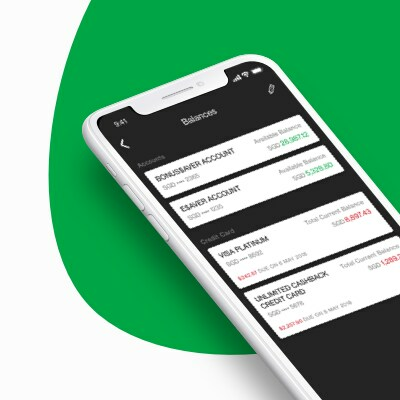 Welcome Screen Balances and Transactions Feature: If you do not register for the Welcome Screen Balances and Transactions Feature, you will need to log in to the mobile banking app manually or with Touch/ Face ID. How can I enable these new features? How can I change the accounts to be viewed for Welcome Screen Balances and Transactions Feature? Tap the menu at the top left of the screen, and tap Settings to change the account listing according to your preference. Will my complete account number be displayed for Welcome Screen Balances and Transactions Feature? If you have not logged in, your account number will be masked. No other information about your account will be displayed other than the balances and transactions which you have configured to view. What if the bank notification alert fails to deliver to my mobile banking app? Will registering for the Inbox Notifications affect my email alerts? No. You will continue to receive email alerts. When I open my Standard Chartered Mobile App, I can see a red notification badge on the top left of the screen. How do I access the notifications? Tap on the red badge or the menu to access your Inbox. Your notifications are stored in the Inbox. I am an Android user. Why am I not able to receive notifications when I’m in China? Google Play is prohibited in China hence Android mobile devices are unable to receive notifications in China. Banking alerts will be sent to you via SMS instead. How many devices can I register for the new features? For security reasons, we only allow users to register for these features on one mobile device. If you wish to register for these features on a new mobile device, your previous device will automatically be de-registered. I am not sure if Standard Chartered Mobile App is supported on my phone. How do I confirm this? Standard Chartered Mobile App is supported on Apple iPhones with iOS 9 and above and smartphones with Android 5.0 and above. You can download the Standard Chartered Mobile app on your new device to register for these new features. This will immediately de-register these features from the previous device that you lost. Alternatively, you can call our 24-Hour Client Contact Centre at +65 6747 7000 for assistance. Can I turn off the animated/video background? Yes, you can. Tap the menu on the top left of the screen, then tap ‘Settings’ and tap ‘Video Background’ to switch the video background off. From 1 October 2018 onwards, all security token cards will cease to function. You will need to register for Standard Chartered Mobile Key if you wish to perform sensitive online and mobile banking activities that require Transaction Signing.